[D]uring March, our Fish Lab breeding pairs spawned five times – one spawn of Clark’s clownfish (Amphiprion clarkii) and four spawns (from three different pairs) of Maldivian Clownfish (Amphiprion nigripes). We also observed an interesting phenomenon this month – we believe that keeping the office lights switched on for longer periods disrupted the clownfish ‘biological clocks’ leading to reduced spawning behaviour. 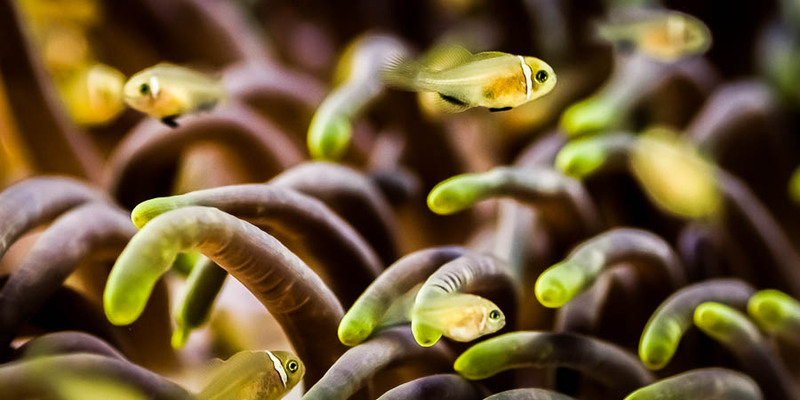 This may have also triggered longer activity periods in the baby clownfish, causing tiredness. We are currently experimenting with different phytoplankton – Nannochloropsis, Isochrysis galbana, Tetraselmis suecica, Chaetoceros. For example, one of our tests was to vary the salinity of the seawater (22% to 28%) to discover which would yield the best growth results. [M]arch was a good month for sightings of marine life, with reef sharks and Hawksbill sea turtles most commonly encountered. We also spotted one of the largest reef fish species, the Napoleon Wrasse (34 sightings); growing up to 2.3m, they are opportunistic predators feeding primarily on crustaceans, molluscs and other reef fish species. 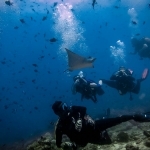 Other species encountered include octopi and various species of shark. The octopus is able to change skin colour by using pigment-containing organelles called chromatophores. They camouflage themselves against rocks and corals to hide from predators and also to ambush potential prey. Ink sacs located between the gills release ink to confuse predators, allowing the octopus to escape in a cloud of confusion! Leopard Sharks are also known as Zebra Sharks as during the juvenile stage their skin is black with white stripes. When they mature, the skin becomes lighter and the stripes turn into black spots. They are nocturnal hunters, and as the light fades they search for crustaceans and molluscs hidden around the reefs using specialised electrical receptors (ampula lorenzini). Once found, the crustaceans are crushed and ground up by the predator’s flattened teeth. White tip reef sharks use “buccal pumping” to actively force oxygen-rich water over their gills, a technique that allows them to rest during the daytime at depths of 30m (which explains why they are more regularly spotted by divers than snorkellers). Under the cover of darkness, the White Tips ascend to shallower waters where they search the reef for sleeping prey such as parrotfish. Black tip sharks can usually be found in shallow reefs at depths of one to six metres, often where a reef ledge leads to deeper waters. 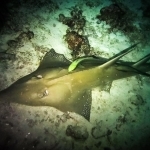 They may be sheltering here, away from larger predators (grey reef and white tip sharks). Nurse sharks are called “sleeping sharks” in Dhivehi (Maldivian language) due to their tendency to spend most of the day time hours resting in caves or under bommies (large standalone coral formations). 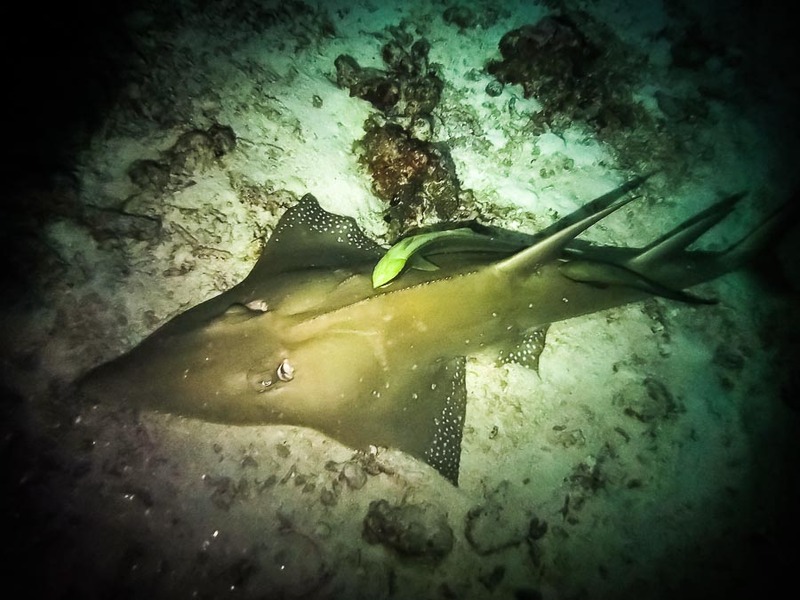 To see a nurse shark out in the open during the daytime is rare; we were lucky to spot juveniles on two separate occasions during March, and there have been recent reports of sightings of pregnant females. Gestation period is believed to be around six months, suggesting nurse sharks could be mating in October, and up to 25 pups can be born at one time. 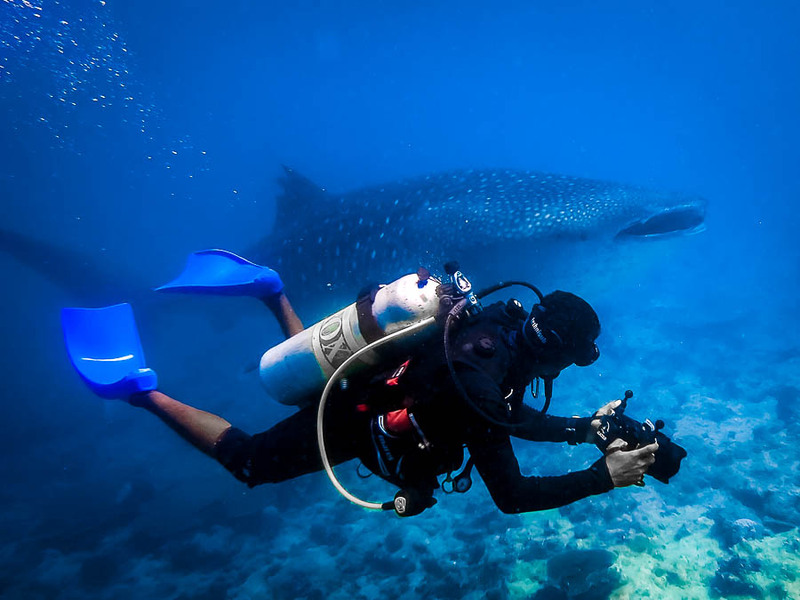 [W]hen searching for whale sharks, we travel in our local dive boat dhoni named ‘Azekara’, which provides maximum mobility, and keep our eyes peeled for the dark silhouettes of the largest fish in the oceans. 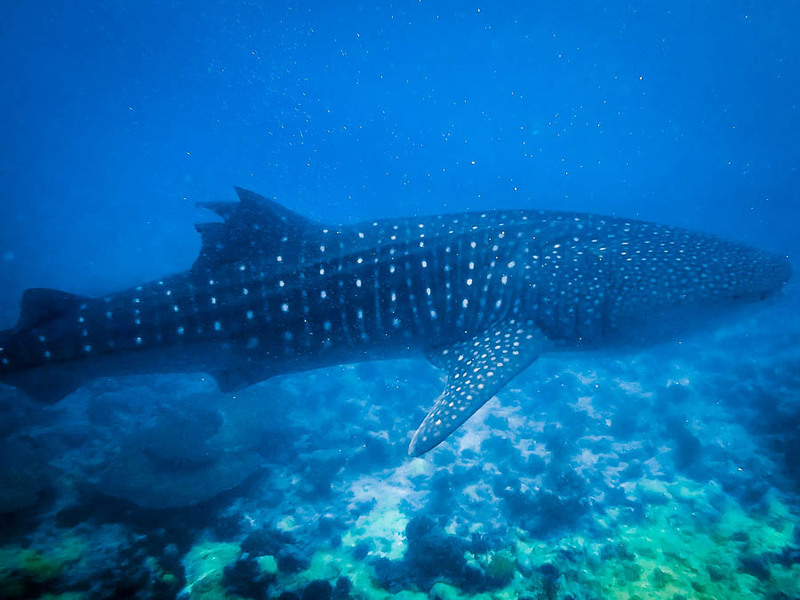 Whale sharks are cold blooded animals, meaning their body temperature is dependent on the external environment. It is thought they feed on large blooms of plankton in the nutrient-rich thermocline at depths of up to 1000m, and then swim to shallow waters to heat up their vital organs before returning again to the deep. 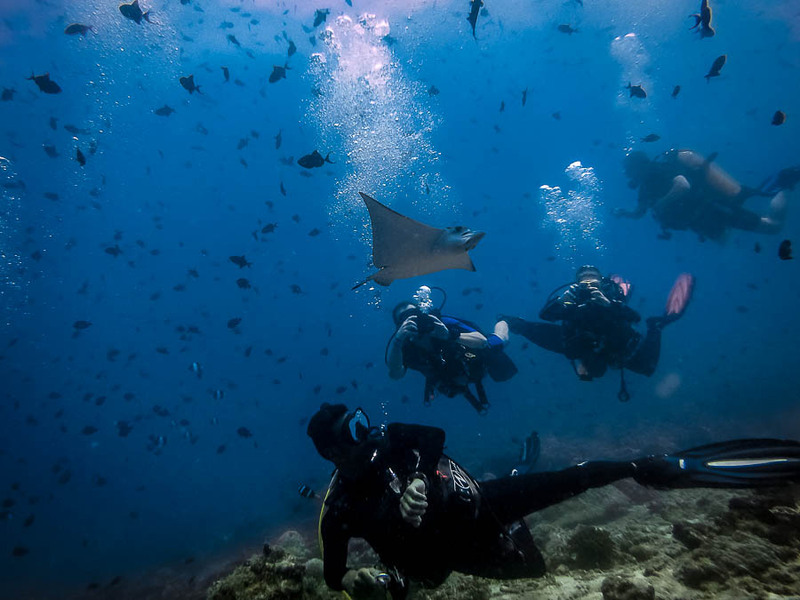 For this reason, it’s much easier to observe these beautiful and graceful animals whilst snorkelling (rather than diving), with the chance of swimming alongside them for a few minutes before they disappear into the depths. 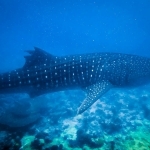 On 29 March we were saddened to spot a whale shark with several injuries including a sliced up dorsal fin, indicating a boat strike with a propeller (click thumbnails below, for high resolution slideshow). 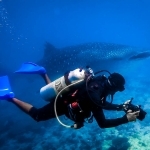 Thanks to David, Marine Biologist at Kuda Huraa, for this special report, and to the whole Four Seasons Explorer team for the great photos.